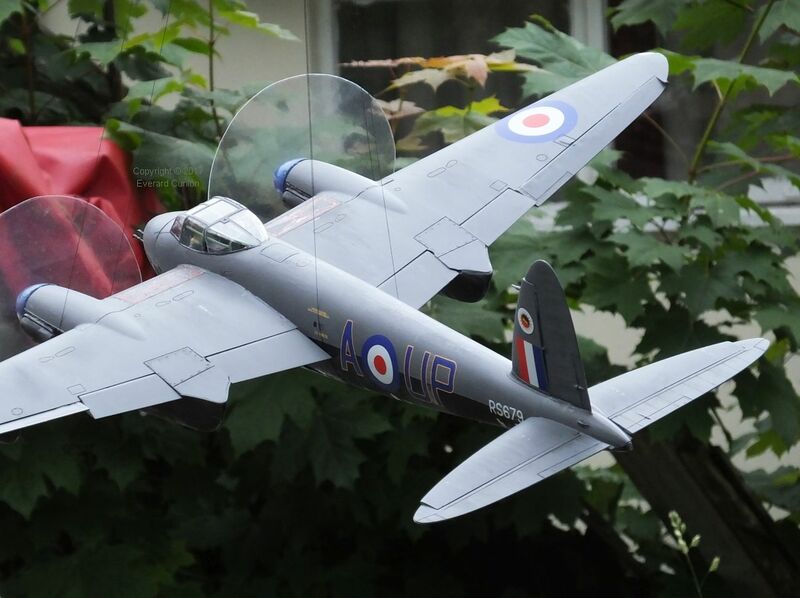 Airfix created their 1/24th scale Mosquito in 2009 and it is of museum quality. For example, even using my rough and ready modelling technique, the rudder pedals move freely! OK, they are not connected to the rudder and it is a gimmick afforded by their construction, but this model is an order of magnitude more advanced than any other plastic kit I have seen. In my view, one of the principal obstacles to plastic modelling is the amount of time and effort it requires. That is one reason why I used the undocumented quick build option for this model. That is, I built it in flying mode with wheels up, crew hatch and weapons bays closed, and with homemade transparent discs instead of propeller blades. That is either the crime of the century or a deft move, depending on your viewpoint. 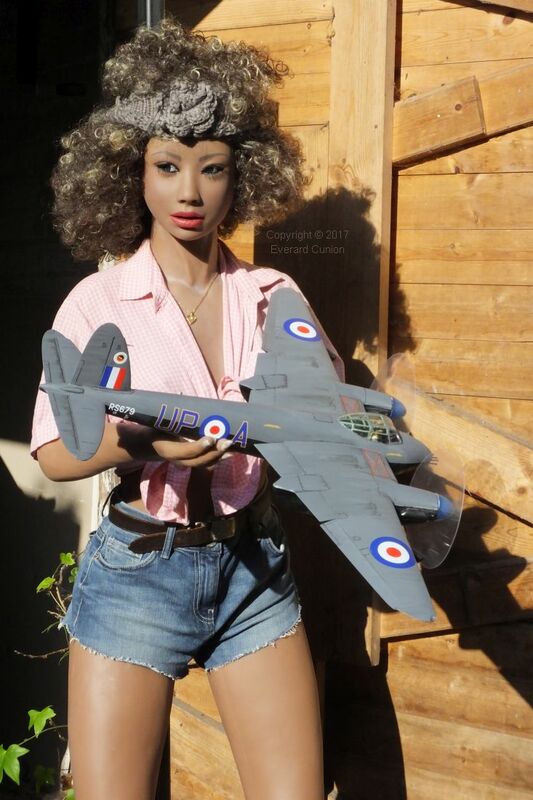 However, like all my models, it is a house decoration and photography subject, not a museum exhibit. Another reason for building it that way is that I prefer the appearance of airplanes in flying configuration. As a result, of the 40 pages of assembly instructions, I needed only 20. The steps I omitted were the most labour intensive, including the undercarriage (with their exquisitely moulded tyres), engines, and weapons; although I did include the front guns (omitting many detail parts) because their barrels protrude, but I painted only the barrels. I did not time it, but at a wild guess I put the entire build at the equivalent of five full days’ work. Maybe, in UK terms, it is the double bank holiday weekend edition. Except for the instrument panel, I built the cockpit interior before painting it. That way, I did not waste time painting detail that cannot be seen. Differences from kits of more usual scales include the need to use a fine saw to separate many of the parts from their runners (sprues) rather than a knife. That is because they are so solidly attached to the chunky runners. I used aluminium foil for the crew harness webbing at the back. I took this photo before I painted those alloy straps (white mixed with the same dirty yellow mix I used for the lifejackets). I retouched the crews’ shoulders while I was at it, but they are still not very good. And, try as I might, I could not get the pilot’s right hand to grip the control column. 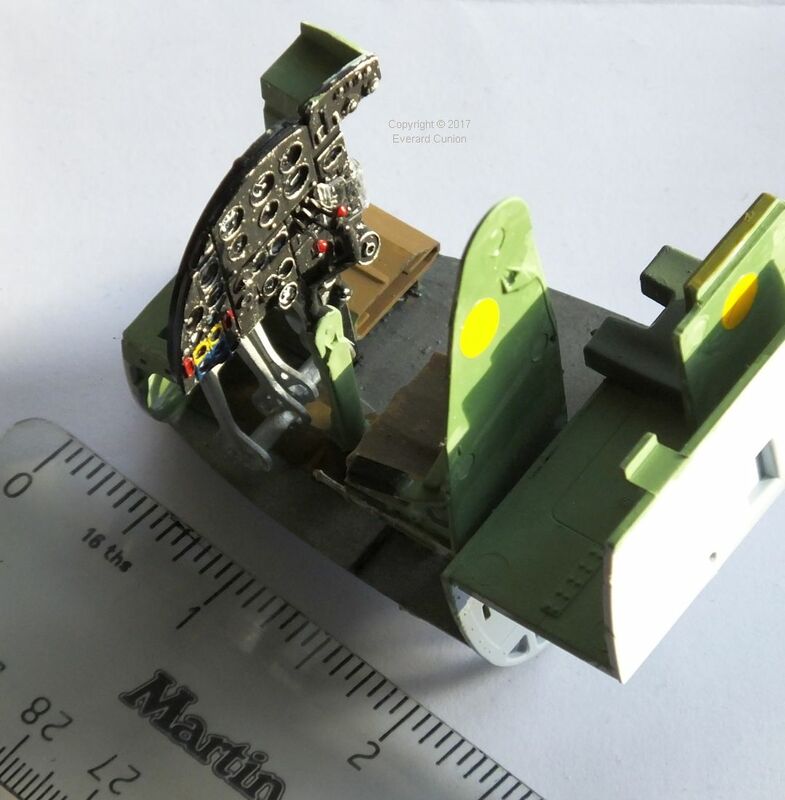 Bear in mind that the full size photo (click the thumbnail image link) viewed on anything but a very small screen shows the assembly much larger than it really is. 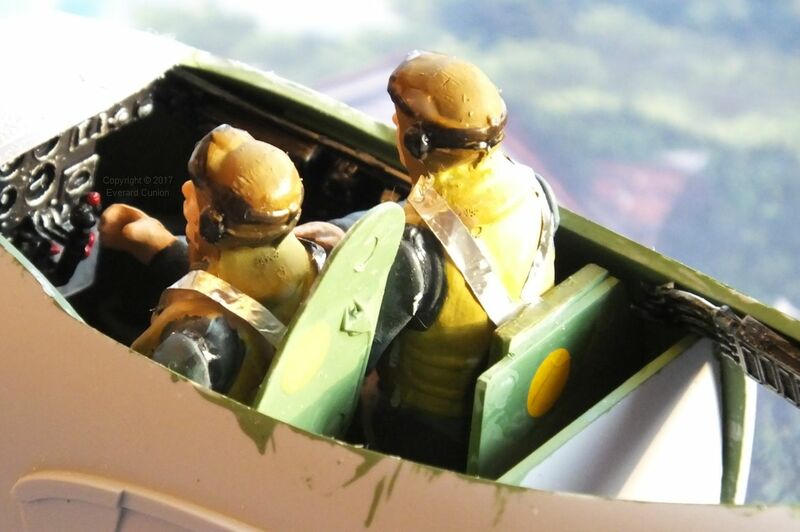 The width of the cockpit across both crewmen’s shoulders is 1.75 inches (43 mm). Therefore, when the canopy is in place, nobody is likely to notice such deficiencies. One problem I encountered was that the two main the bulkheads – a large one in the middle and a small one near the tail – needed filing down to get the fuselage halves to come together. Another difficulty I encountered was fitting the wing assembly to the fuselage. It was a trial of puzzlement followed by application of force. Eventually it snapped into place without snapping. Afterwards, it needed a small amount of filler at the join on one side. Attaching the spinners with their transparent discs (to look like spinning blades – arguably) was also a problem because I did not add the engines, to which they would normally attach via the prop hubs. 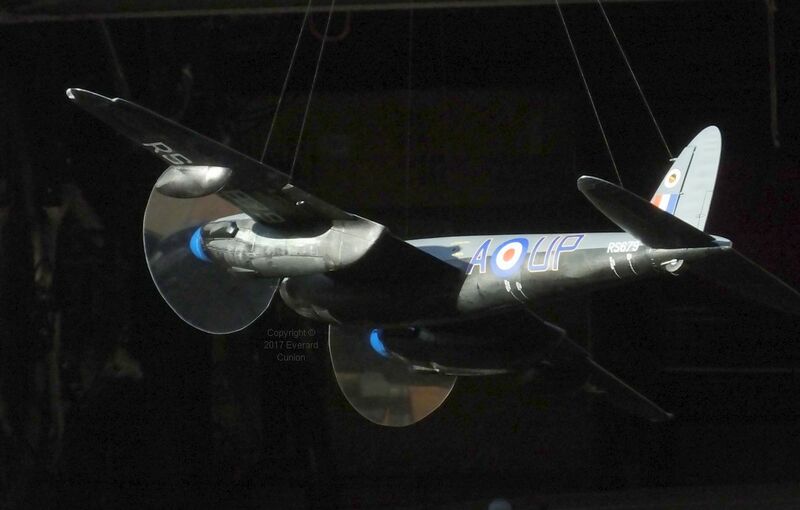 The propellers really need to be removable, otherwise putting the model down on a flat surface is impossible without risking the transparent discs. 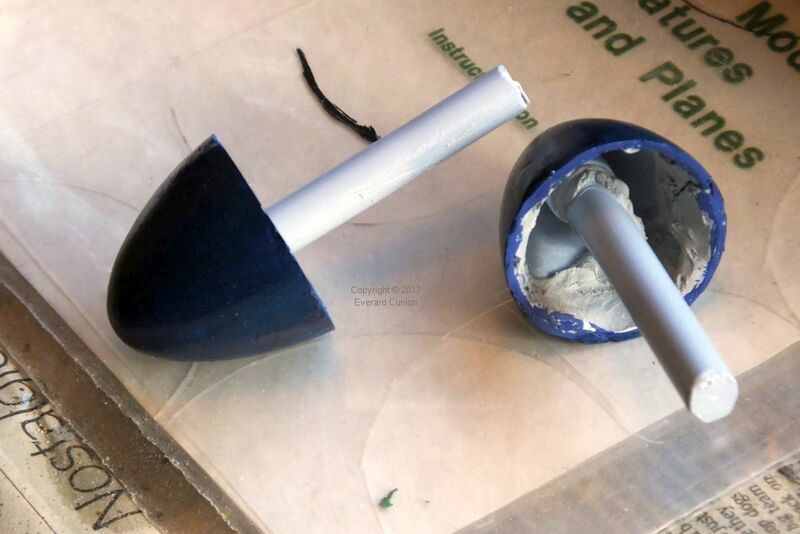 I used rods of runner attached inside the hubs with polystyrene cement and filler. I had to file out the holes in the fronts of the engine casings (where the hubs would normally plug in) to enlarge them slightly to accommodate these new axles. The filler around the circumference, visible in the photo, blocks the U-shaped holes where, in a model built the normal way, the propeller blades emerge. The photos show the spinners in midnight blue. However, photos of the real thing seem to show a lighter colour, so I repainted them in Humbrol #52 gloss Baltic blue. I rubbed away some of the lighter colour at the back while it was still wet, revealing the underlying midnight blue, to simulate the darkening that I imagine occurs from the spinning black blade roots. I think it looks moderately convincing anyway. 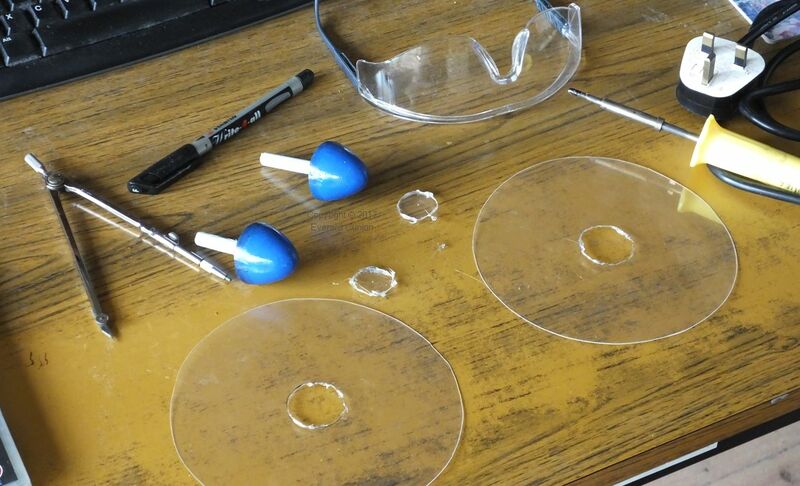 To make the propeller discs, I used thick 0.4 mm clear styrene sheet. I could not get scissors in through the middle, so I used a soldering iron to cut the central holes. The finished model measures 27 x 20.6 inches (69 X 52 cm). 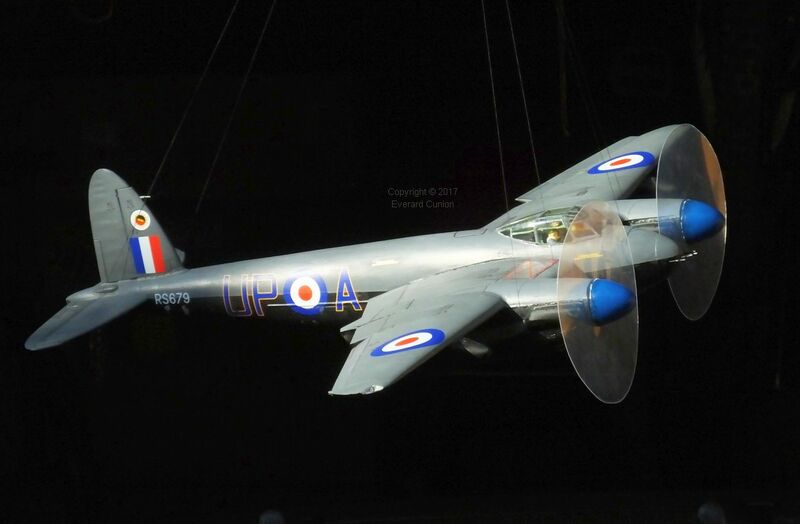 Conceived during World War 2 and build largely of wood, the Mosquito was for a time the fastest airplane in the world. After that war – and just before its replacement by jets – Mosquitoes stood ready for, and practised in, the defence of Germany and the rest of the west against a perceived Soviet threat. I chose the post-war colour scheme (provided for in the kit) because it seems to me to lend a thoroughly vintage appearance to this already strange looking craft. Indeed, to my eyes, the sporty looking and partly glossy colour scheme imparts an almost pre-war flying club appearance. Yet the Mosquito began life during the war against Germany that had ended in an allied victory only four years before the cold war duty in which it wore that scheme. 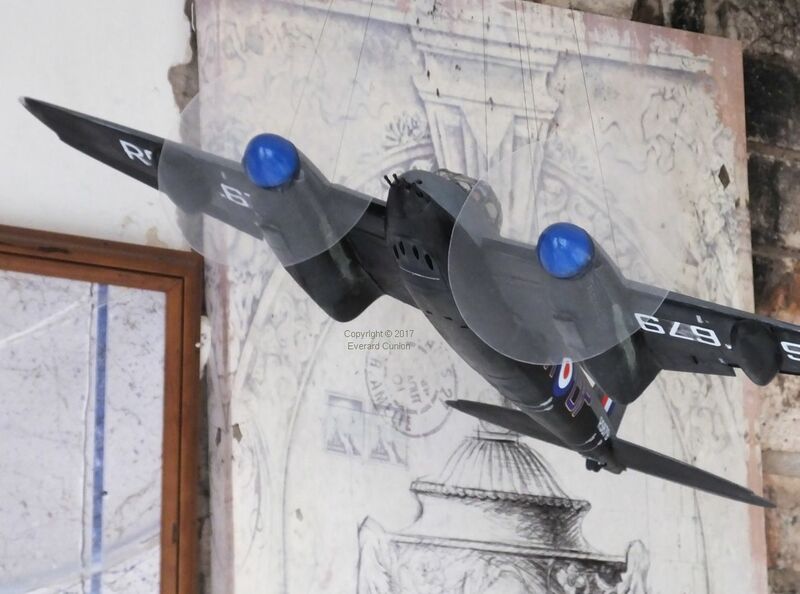 Most Mosquitoes of RAF 4 squadron at Celle (West Germany) had upper surfaces in medium sea grey, as called for by the Airfix instructions. Medium sea grey is actually a light grey. However, photos of the particular machine provided for by the decal sheet indicate that it was one of several examples with upper surfaces in a darker colour. I used dark sea grey, which is darker than the real thing, but it looks good in my view. See References and the external links for more on that. When you add the gloss blue to those big propeller spinners, something happens to one’s perception of its dark colour scheme as a whole.